Through continents and cultures a rose means true love and it is the epitome of it. 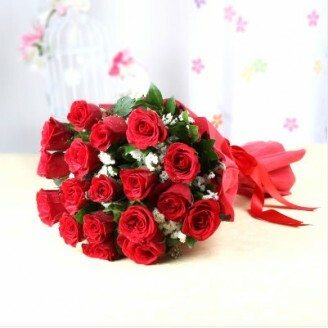 To signify this pure love you want to show your loved one we have a hand bunch of 24 bright and fresh red roses. These stunning double dozen deep red roses are wrapped in beautiful paper packing with a neat ribbon. We also give you the option of different colored roses such as yellow, pink and white. Whatever your choice, you can be sure of one thing, love will be the strongest message this arrangement gives. Send this 24 roses bunch online to your loved ones and make them feel special with this romantic and lovely surprise. The sparkle you will see in their eyes when they receive this delivery of 24 red rose bunches, will be absolutely priceless. Delivered merchandise might vary with the images shown above.•	Delivery may not apply for timings during different events like: Valentine’s Day, Friendship Day, Christmas etc.